I don't leave the house to go to work everyday but I do work at home..and I am sure my family (and my teeth!) would love if I would brush my teeth during the day! This annual holiday encourages people to add a third brushing occasion to their day, because whether you're hard at work or a hard-working mom, oral health is important in order to maintain a healthy and white smile. Sadly, less than half of U.S. office workers keep a toothbrush at the office so that they can give their pearly whites a cleaning during the workday. 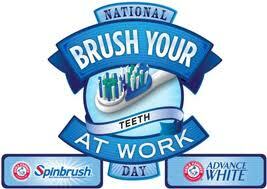 And if they do have a toothbrush at work, about half of them are not USING them on a daily basis! To encourage more Americans to add a third brushing occasion to their day, ARM & HAMMER Spinbrush ProClean battery-powered toothbrushes has declared the third annual “Brush Your Teeth At Work Day” for Thursday, April 19, 2012. 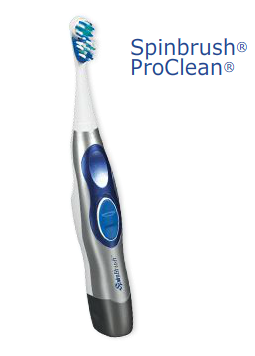 There is no greater toothbrush to use and bring to work for your third brush in the day than the Spinbrush ProClean! It provides a more efficient clean than a manual brush, removing up to 70% more plaque in hard-to-reach places! Plus, it is a battery-powered toothbrush so you don't have to worry about keeping it charged or carrying around a cord at work! So don’t let another year pass until the next national ‘Brush Your Teeth at Work Day’ without pledging to improve your brushing routine! Grab a Spinbrush ProClean toothbrush and find a great spot for it at work! Win It: Arm & Hammer is generously offering (1) "Brush Your Teeth at Work Day" toiletry kit (which includes an Arm & Hammer Spinbrush toothbrush and Arm & Hammer toothpaste) to a lucky winner!